Google is "pausing investment" in its consumer-facing messaging app, Allo. By that, the tech giant means transferring the entire workforce to other projects and shifting all resources to the Android Messages team. 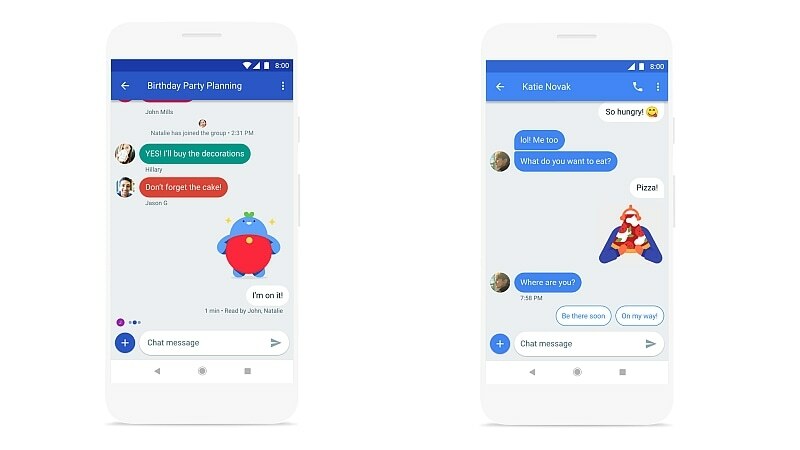 The Android Messages app will power the long awaited RCS platform that Google has been working with carriers and OEMs for years on with the aim of doing away with the severely limited SMS platform, and now we know that platform is being given a name called 'Chat'. While Android Messages will be used as the default Chat client on most Android devices, we can expect some OEMs and carriers to offer their own apps. Chat will be based on Universal Profile for Rich Communication Services (RCS) standard that involves partnerships with mobile carriers to incorporate the feature right into the default SMS app, reports The Verge in an exclusive interview with Google's new head of its communications team, Anil Sabharwal - who was formerly in charge of Google Photos. No, Chat is not another messaging app from Google's stable; instead, it is a "carrier-based service" that will be turned on by default inside the Android Messages app. Notably, while it takes on the likes of WhatsApp and Telegram, it will not offer end-to-end encryption as it follows SMS-like legal intercept standards. All this doesn't mean Allo will be shut down anytime soon, and Sabharwal says Google is "continuing to support the product." Rich Communication Services or RCS is a relatively new IP-based messaging protocol that allows for sharing high-resolution photos, group abilities, and other such enhanced capabilities. Google will include several smart features, such as the Smart Replies, GIFs and stickers, Google Assistant support, Google Photos integration, better message search, group chats, and even a Web interface that's similar to the WhatsApp's - using a QR code to sign in. An interesting aspect of the Chat feature is that messages will be sent using your data plan and not as part of regular SMS messages. So, if your carrier is willing, and if you have a good unlimited plan, even SMS messages will cost you almost nothing. Currently, 55 carriers (including Airtel and Vodafone), 11 OEMs, and two operating system providers support Chat. Operating system providers include Google and Microsoft. The report adds that this doesn't mean you can expect a Windows client for Chat soon, but, that it is possible. Microsoft in a statement to The Verge said, "RCS Universal Profile support for capabilities such as dialer and messaging functionality or other applications is considered on a device-by-device basis, where there is demand for those features." Back in February last year, Google had partnered with 27 mobile carriers to preload RCS on to the tech giant's default Android Messages app. The partnerships is said to cover more than 1 billion mobile subscribers worldwide. Google has been working for a while to bring SMS-replacement tech to Android, and bought Jibe Mobile back in 2015 for the purpose, and has since been partnering carriers to broaden adoption. Timelines of the rollout is in the hands of mobile carriers as Google hopes to connect with most major ones. When asked to speculate, Sabharwal said, "By the end of this year, we'll be in a really great state, and by mid-next year, we'll be in a place where a large percentage of users [will have] this experience." He says the rollout will vary "from country to country", and regions like Europe and Latin America are likely to enable it ahead of the US. He adds, "This is not a three- to five-year play. Our goal is to get this level of quality messaging to our users on Android within the next couple of years." And, much like iMessage, if you send messages to an iPhone or any handset with Chat not enabled, they will be sent as regular SMS messages. Unlike iMessages though, the platform will not be closed, and despite being interoperable, will allow carriers and OEMs to customise their Chat apps and services. "We can't do it without these [carrier and OEM] partners. We don't believe in taking the approach that Apple does. We are fundamentally an open ecosystem. We believe in working with partners. We believe in working with our OEMs to be able to deliver a great experience," Sabharwal told The Verge. Of course, whether Apple will ever support Chat is a big unknown. Even Samsung's default messaging app will support Chat, although Android users are free to install the Android Messages app from Google Play. The Mountain View giant recently launched Hangouts Chat, an enterprise messaging app to take on Microsoft Teams and Slack. The consumer version of Hangouts will soon be merged into Hangouts Chats, and the plan was earlier that Allo would fill the gap. Now that Google has given up on Allo however, we're left with Duo and Android Messages as the only two consumer-facing offerings. Google is happy with the way Duo is doing, and isn't going to "pause" development on it anytime soon.